Born as the son of Anandha dhIkshithar and nAchiyAramman, he was named dhAsarathi. He is the nephew of emperumAnAr. He is also known as rAmAnujan ponnadi, yathirAja pAdhukA, srIvaishNava dhAsar, thirumarumArbhan and becomes to be famously known as mudhaliyANdAn (meaning “leader amongst srIvaishNavas”). He is also known as the lotus feet of emperumAnAr (yathirAja pAdhukA) and thridhaNdam of emperumAnAr. Note: AzhwAn and ANdAn are so dear to emperumAnAr and inseparable from him – kUrathAzhwAn is known as the jala pavithram (flag which is tied in emperumAnAr’s thridhaNdam) of emperumAnAr. emperumAnAr had great liking for ANdAn due to ANdAn’s bhagavath/bhAgavatha nishtai (attachment towards bhagavAn and his devotees). When emperumAnAr accepted sannyAsam, he declares that he gives up attachment to everything else but ANdAn – such was ANdAn’s greatness. After emperumAnAr‘s acceptance of sannyAsAsramam, AzhwAn and ANdAn becomes his first sishyas. They both learn sAsthram (ubhaya vEdhAntham – samskritham and arULicheyal) and its essence from emperumAnAr himself. They also follow emperumAnAr to srIrangam when he leaves kAnchipuram. Under emperumAnAr’s divine orders, ANdAn fully takes control of the temple administration and ensures proper functioning of all aspects of the temple activities. When thirukkOshtiyUr nambi instructs the divine meanings of charama slOkam to emperumAnAr, ANdAn requests emperumAnAr to teach him the same. emperumAnAr asks ANdAn to go to nambi and request him. ANdAn spends 6 months at nambi’s thirumALigai (home) and serves him patiently. At the end of 6 months, when ANdAn requests nambi to teach the meanings of charama slOkam, nambi says emperumAnAr himself will teach that to him once he develops Athma guNams fully. nambi places his lotus feet and ANdAn’s head and bids him farewell. emperumAnAr seeing ANdAn’s return, is very pleased with ANdAn’s bhAvam (mood of servitude) and at once instructs him the divine meanings of charama slOkam. ANdAn’s total surrender to emperumAnAr can be understood from this well known charithram (historical incident). Once periya nambi‘s daughter aththuzhAi goes to his mother-in-law and asks her for some one to accompany her when she goes to take bath in the river for safety/assistance. Her mother-in-law says “you have to bring your own srIdhana veLLAtti (assistant)”. aththuzhAi goes to his father and asks him to arrange for an assistant. periya nambi says since they are fully dependent on emperumAnAr, she has to go and request him for that. emperumAnAr looks around and spots ANdAn and asks him to go with aththuzhAi as her assistant. ANdAn happily accepts his master’s orders and follows her. He starts helping her regularly. aththuzhAi’s in-laws become very concerned seeing ANdAn (who is a great scholar and the leader of rAmAnuja sishyas) coming and performing lowly work of servitorship at their home and asks him to stop that. ANdAn immediately says that it was emperumAnAr’s order and he will just do it. They immediately go to periya nambi who sends them to emperumAnAr. emperumAnAr says “you wanted an assistant and I have sent one – if you dont want him, you can send him back”. aththuzhAi’s in-laws realize their mistake and ask ANdAn to stop serving them. They realize the greatness of periya nambi, emperumAnAr, ANdAn and aththuzhAi and take good care of her subsequently. But this incident shows the greatness of ANdAn in fully following his AchArya’s words. We can easily understand, if some one is to be declared as the lotus feet of emperumAnAr, they must possess utmost auspicious qualities and ANdAn was indeed an epitome of such good qualities. ANdAn travels with emperumAnAr during emperumAnAr’s journey to mElkOte (thirunArAyaNapuram) due to saiva king’s unfavourable actions. In a place named mithulApuri sALagrAmam, there lived many people who were staunchly opposed to vaidhIha dharmam. emperumAnAr asks ANdAn to touch the water source (river) where everyone takes bath with his lotus feet. ANdAn obliges and when everyone takes bath in the river which now has ANdAn’s srIpAdha sambhandham (relationship with his lotus feet), they become purified. The next morning every one arrives to see emperumAnAr and takes shelter of him. Thus, we can understand the greatness of a pure srIvaishNava’s srIpAdha thIrtham which can purify anyone. kanthAdai ANdAn who is the son of mudhaliyANdAn takes permission of emperumAnAr and makes an archA vigraham (form) for emperumAnAr. emperumAnAr embraces this vigraham and becomes very fond of it. This vigraham is then placed in his avathAra sthalam (srIperumbUthUr) on thai pushyam (this day is celebrated as guru pushyam in srIperumbUthUr even today) and is famously thAm ugantha thirumEni (the vigraham that was liked by rAmAnujar himself). ANdAn’s instructions and glories are identified in various places in the vyAkyAnam. Let us see some of them now. thiruvAimozhi 2.9.2 – nampiLLai eedu vyAkyAnam – ANdAn’s magnanimity is revealed in this incident beautifully. Once a sishya of ANdAn goes to embAr when ANdAn was out of town. embAr accepts kainkaryam from that srIvaishNava and considering that he may not have had AchArya sambhandham, he performs pancha samskAram to him and starts imparting divine knowledge to him. When ANdAn returns, that srIvaishNava returns to ANdAn and starts serving him. embAr comes to know about this and he runs to ANdAn and tell him “I did not know that he was your sishya already and please forgive me for this apachAram”. ANdAn, peacefully replies to him “When some one falls in a well, if two people lift him up, it will be a lot easier. Similarly, this person is in samsAram, if two of us help him it will be beneficial only”. This kind of purity in heart is very rare to see which is constantly manifested by ANdAn. thiruvAimozhi 3.6.9 – nampiLLai eedu vyAkyAnam – In this padhigam archAvathAra emperumAn’s glories are fully revealed. ANdAn explains that “Dont think that paramapadhanAthan takes this archAvathAra form to please his devotees here, instead think that this archAvathAra emperumAn is more important and he is manifesting himself as para-vAsudhEvan in paramapadham”. thiruvAimozhi 5.6.7 – nampiLLai eedu vyAkyAnam – In this padhigam, emperumAn’s sarva vyApakthvam (omnipresence) is explained. Here parAngusa nAyaki (nammAzhwAr in the bhAvam of a girl) says that emperumAn will destroy his relatives as well. ANdAn gives a beautiful explanation that “emperumAn will destroy (melt them completely) them (those who are attracted towards him) by showing his divine beauty”. 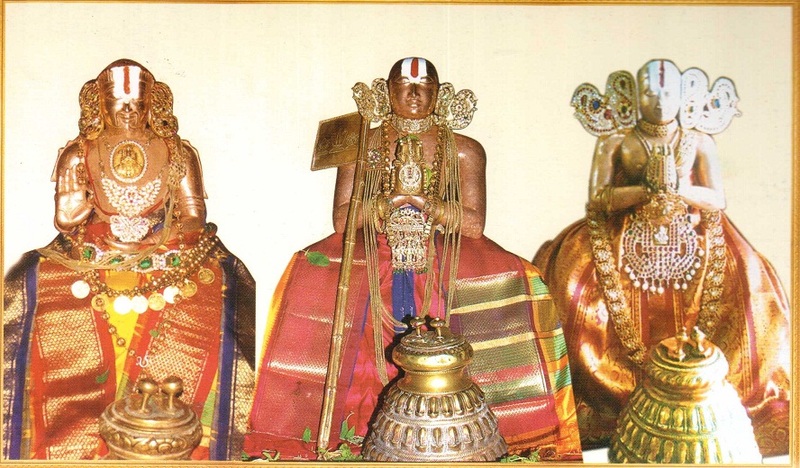 thiruvAimozhi 6.4.10 – nampiLLai eedu vyAkyAnam – ANdAn’s attachment and concern towards archAvathAra emperumAn (namperumAL in this case) is explained by nampiLLai here. 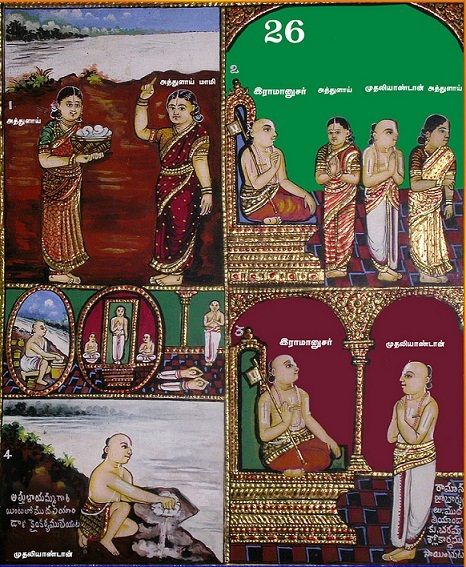 nampiLLai identifies a narration of nanjIyar involving embAr and ANdAn. In samsAram, there are so many people who are unfavourable to emperumAn. 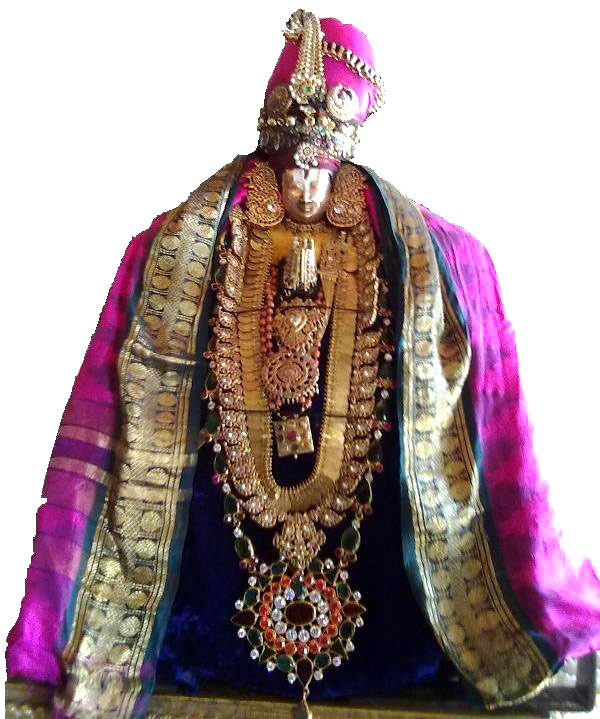 archAvathAra emperumAn is tender natured and is making himself fully dependent on his devotees. 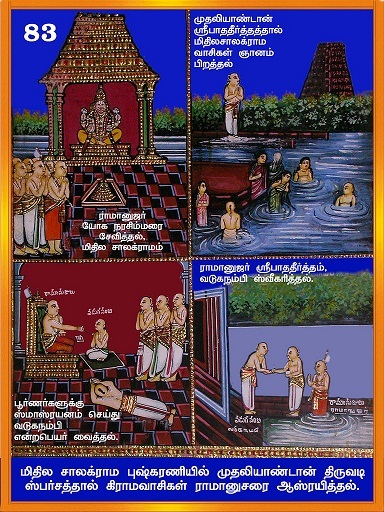 After the completion of a brahmOthsavam, embAr and ANdAn meet, offer obeisances to each other, embrace themselves and happily proclaim that namperumAL (srIranganAthan) reached his AsthAnam safely after the uthsavam even in this case. He was true to the nature of our pUrvAchAryas who are fully focussed on mangaLAsAsanam. thiruvAimozhi 8.10.3 – nampiLLai eedu vyAkyAnam – When bhattar asks AzhwAn about “srirumA manisar” (siru means small and mA means big – how does smallness and bigness exist in the same person), AzhwAn explains ANdAn, aruLALa perumAL emperumAnAr and embAr are small in posture (and are like us in their dependence for food for sustaining themselves) but they are greater than nithyasUris in their bhakthi towards emperumAm – thus smallness and bigness exist in the same persons. thiruvAimozhi 9.2.8 – nampiLLai eedu vyAkyAnam – During a srIjayanthi purappAdu in srIrangam, vangippurathu nambi joins the cowherd girls group and worship emperumAn from there. ANdAn asks him what he said when he was in that group. nambi says “I said vijayasva”. ANdAn replies when you are there with those girls, you should glorify him in their own language instead of this hard samskritham. Thus, we have seen some glimpses of the glorious life of mudhaliyANdAn. He was fully situated in bhAgavatha nishtai and was very dear to emperumAnAr himself. Let us pray at his lotus feet that we too get a little bit of such bhAgavatha nishtai. This entry was posted in other AchAryas and tagged kandadai on March 29, 2013 by sarathyt.